There may be no room for a spare on a Quad, but having OKO in the tyres is the next best thing, without the large weight penalty. It deals with the tough stuff off-road and still copes with faster race or on-road riding (where laws allow). Farmers, recreational riders and racing users alike will appreciate the extra security that OKO provides. It’s a winning choice. 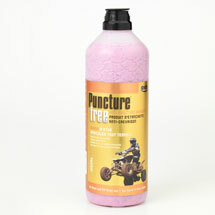 1.25 litre bottle deals with 2 to 4 tyres depending on size (see Dosage Calculator on this page). 25 litre drum is ideal for retailer and service workshops and team support garages: the NEW heavy-duty, adjustable all-alloy drum pump is a one-time purchase and can be rinsed out again and again for repeated use in filling tyres rapidly. NO ADVERSE AFFECT UPON TYRES OR RIMS (contains anti-corrosion agents that protect steel and alloy wheels). DO NOT USE with CHROME PLATED WHEELS which are highly vulnerable to any chemical. Colour: Reddish Pink. Viscous. Low Odour.